Back of card: Solid black. In the center, the superimposed white outlines of a male & female, also black, displaying the seven major chakras in the color appropriate to each. Not symmetric, so in principle not for inversion, but in practice you probably won't notice. Booklet included: No. There is no booklet enclosed with this deck. There are three extra cards. See notes below. Publisher: www.WhiteLightTarot.com. Country of origin not given. Comments: The murky sort of deck. The subtitles from the box are, The Light From Within, and, Reiki Energized, Chakra Encoded. Reiki is a secret, proprietary healing method where the more money you pay, the more advanced you become. I stopped being impressed by it some time ago. So far as I can tell, there is no way to distinguish a genuine Reiki Master from someone who has been swindled of $10,000 - and there's probably a lot of the later. Those who are serious about Reiki should correct this immediately, but probably won't. The Three Cards: All three cards are white with black ink, except as noted. Tarot cards date from at least the 15th century, Italy. 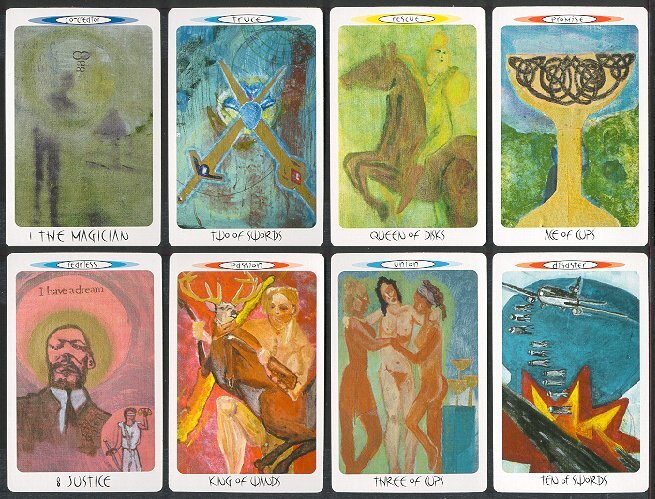 Very few people could read, so the tarot, as an allegorical pictographic system, demonstrated principles to live by, and archetypes of universal meaning. Our cards are infused with reiki energy, a form of spiritual healing. Translated from the Japanese, 'rei' means 'soul' or 'light' and 'ki' means 'energy' or 'life force'. Each chakra has its own group of characteristics that it governs. White Light Tarot endeavors to update & combine tarot symbols with an essential indicator chakra for each card to aid in conceptual understanding. Before I go on I should note that when tarot became popular at some point in the 17th century, they were never used as a means of instruction for daily living. For that, people turned to the great sculpted stone cycles at their local cathedral. In this period, tarot was used strictly for fortune-telling. The back of the first instruction card has an outline of a figure on the left, with little "balloons" of text of different colors, with arrows pointing to the various chakras. Numbering from top to bottom, No. 5 reads, 5. Throat: communication, openness to new things, self-expression. As these are all color-coded, a guess would be that we are to match the color to the cards to determine which chakra(s) may apply to any given card. In particular, the color at the very top of the card, behind the single keyword. There is otherwise no visible card-to-chakra indicator. Instruction card 2, page 3, is a simple list of keywords for the suits, and the fourteen cards that make up a suit. So, all kings are described as yang, male, suface, light. Card 10 is always about completion, back to the beginning. Card 6 is standard, predictable, capable. Instruction card 2, page 4 shows a simple three card spread. The first card is the problem, the second is the action, the third is the outcome. Yes/No questions can be answered using the same three cards: Two of three cards upright: Yes. Two of three inverted: No. Instruction card 3, page 5 lists the ten cards of the standard Celtic Cross layout. Celtic Cross card 4: 'This card is below you,' indicates dreams, feelings, or subconscious thought. Page 6, the last page of instruction, is a diagram of the Celtic Cross layout. There is one change, a significant one: There is a card underneath the first card, labled Querent. This would presumably be a face card (king, queen, knight, page) whom the querent most closely resembles.